Morgan and I had a wonderful, albeit quick, Christmas! This was the first year that we didn't have 10 or more full days off at Christmas. Usually we finish up finals a few days before Christmas and start back to school in January. This year, Morgan only had we only had the 24th - 26th off, and I only had the 23rd - 28th off. And while this didn't keep us from having a great Christmas, it did make Christmas seem a little more rushed, although its probably what everyone else already experiences. Even though it was quick, we kept to our usual Christmas traditions. We always spend Christmas Eve with Morgan's side of the family, and Christmas Day with my side. Morgan and I are extremely lucky that both our families live in Eau Claire and we are able to celebrate the holiday with each of them. It just happens to work out that Morgan's family celebrates Christmas Eve, and my family celebrates Christmas Day. This is my favorite ornament at my parents' house. All of my siblings love it. This year Christmas Eve had a little added excitement. Morgan and I both ended up in the emergency room in Eau Claire after being exposed to carbon monoxide. We were at Morgan's parents' house for the day and we were having a great time. People were cooking, baking, playing cards, and relaxing. Our brother-in-law Adam was nice enough to prepare a turkey for dinner. Well the turkey needed to be cooked at 500 degrees for a short time, and he noticed that the oven was having a difficult time reaching the set temperature. No one thought much of it and actually left for church. Morgan and I stayed behind, we were going to Mass with my parents later in the evening, to set the table and get some stuff for dinner ready. Shortly after everyone left we noticed that the kitchen smelled like gas. So we immediately shut off the stove/oven and opened windows. Morgan left to bring the turkey to his brother's house. After he left I got super tired and decided to take a nap. So I was snoozing on the couch when all of a sudden an alarm starting going off. It took me a couple minutes to figure out where the alarm was and what it was. My first thought was the fire alarm, but there was no fire. Finally I figured out that it was the carbon monoxide detector. So I left the house (with all four dogs) and waited for Morgan to get back. Since I was tired and had a headache I called my doctor's office who referred us to poison control. Morgan also had the same symptoms when he got back. We were told to head to the emergency room by poison control. So we headed to the ER. They were expecting us when we got there. At the emergency room, they took our vitals, and drew some blood. While we waited for the results from the test, we were given oxygen masks to wear. The nurse also used the doppler to find Henry's heartbeat to make sure he was fine. Thankfully, he was able to find the heartbeat right away and it was a strong 150. 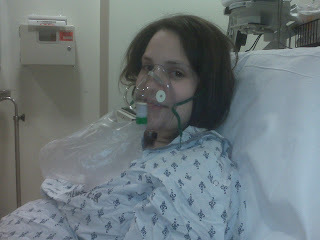 Morgan and I were still feeling pretty crumby so we just rested with the oxygen masks for about an hour. Finally, the test results were back and they showed that our blood levels were within normal ranges. Then we were discharged and allowed to head back to the party. Thankfully everyone was fine, and we were able to have a wonderful meal (even without the use of the oven)! Morgan and the dogs on Christmas Eve after the scare. Nettie wasn't feeling well, so she sought comfort on my towel. Weirdo. In the ER. Looking lovely, not feeling so great. Christmas Day was much less hectic but also a ton of fun. All of my immediate family was there. We spent the morning opening presents and of course eating! The afternoon we spent relaxing and just enjoying each other. A few people took naps and some went skiing. Soon it was time for apps and dinner! My Mom made beef wellington and my Dad made duck. We also had my favorite jello! It was all amazing! That night we all sat around and played a Christmas trivia game. My parents decided to auction off a bottle a of champagne to the winner, which made for a very competitive game! Jeff was very excited about his gift. Haha. Overall it was a great holiday that just came to an end way to quickly. Its also super weird to think our last child-less Christmas is behind us. But it also gives us a ton to look forward to for next year! !